In Early June, I had the opportunity to visit the Lizard peninsula in Cornwall to put up a log hive on a small farm. The fields and hedges were ablaze with wildflowers and so my first impression as a drove down the mile-long rutted track, was this could be a very good place for bees. I am very grateful to Senara Wilson Hodges of On the beach productions for making such a beautiful film. Really enjoyed that video – very informative. How critical is the orientation of the entrance? You state SE, my ‘hive in a tree’ entrance is more NE (than east). Is your hive populated? Can it be moved easily? Just watched this video Matt – it’s brilliant! thank you so much for all you are doing!!! Did you see the queenbee at the entrance hole at the end of your video (at 13:24)? Fantastic. What a wonderful film. I remember seeing on TV a researcher in Africa using logs as hives and suspending them as a way of dealing with marauding elephants. The bees were far better at disuading the elephant than any other kind of system. Bees are incredible. Thankyou for what you are doing to help them (and us) survive. 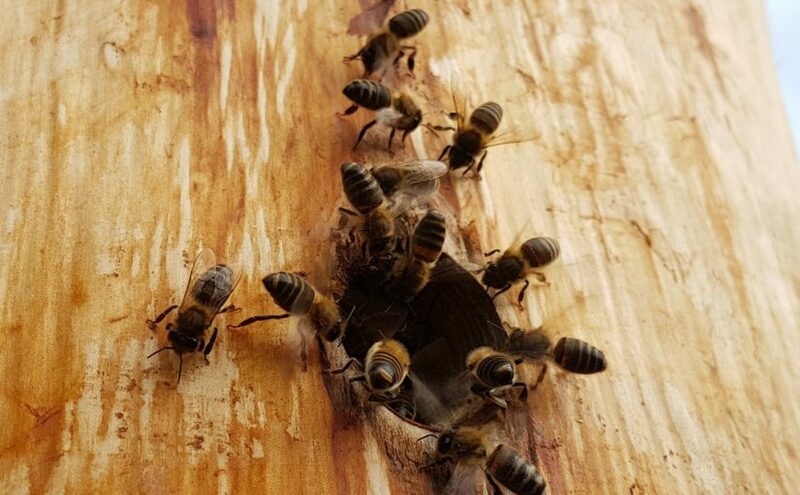 Previous Previous post: The Wonder of a swarm!